Heat oven to 350°F (325°F for dark or nonstick pan). Grease bottom only of (8- or 9-inch) round or square pan. Beat cake mix, milk, butter, extracts, nutmeg and eggs in large bowl on low speed 30 seconds, then on medium speed 2 minutes, scraping bowl occasionally. Pour into pan. Bake 33 to 41 minutes or until toothpick inserted in center comes out clean. Cool 10 minutes. Run knife around inside edge of pan. Cool 30 minutes longer. Heat frosting in microwavable bowl 10 to 15 seconds or until easy to drizzle. 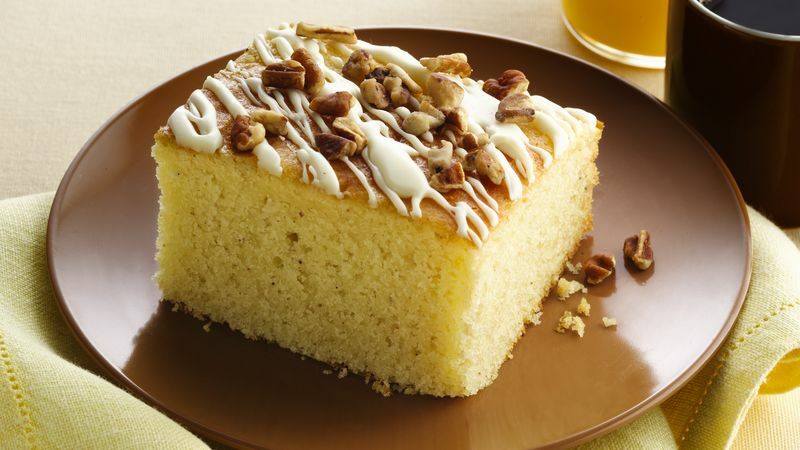 Drizzle frosting over cake; sprinkle with pecans. For an indulgent treat, use candied pecans. Just make sure they're gluten free. Betty’s mixes won gold. The Edison Best New Product Awards are given annually and are voted on by a not-for-profit group. Enjoy this recipe using one of the mixes.